In an interview with General Manager, Sayed Sobhan (RRI), vegasonlyentertainment.com (VOE) welcomes the popular, budget-friendly Red Roof Inn to the Las Vegas Valley. The 200-room hotel, situated across the street from the Hard Rock Hotel on Paradise Road, was formerly a Choice Hotels Comfort Inn. The predominantly mid-western Red Roof chain is celebrating forty years of living up to its motto of “nice place, nice price.” For three consecutive years, the brand has been awarded #1 in customer satisfaction scores according to the ReviewMetrix™ Consumer Satisfaction Index, which is based on TripAdvisor® online reviews. VOE: With a history of being part of the Choice Hotels family what was the deciding factor to embrace the Red Roof Inn as opposed to other brands? RRI: We believe the Red Roof Inn motto of “One Brand, One Focus” will go a long way in bolstering and uplifting our sales and marketing efforts by providing a much closer partnership between Franchiser and Franchisee. VOE: How difficult was it to transition? RRI: Transition is almost always never easy. In addition to the change in philosophy, there is a lot of hard work involved in transferring data from the old to the new PMS (Property Managements System), in addition to training all the operational staff and managers. VOE: Was the preponderance of your guests in the past historically from the Midwest? RRI: Choice Hotels command a very wide geographic area. As a result, we had guests from all over the country as well as the Mid-western States. VOE: How important is the Midwest tourist market to Las Vegas? RRI: The Midwest market is just as important to us as any other tourist market. The general economy and consumer disposable income levels are always the final deciding factors. VOE: This is the only RRI in the Vegas Valley to date. How do you plan to position yourself in the South West market? RRI: Our immediate feeder cites are Los Angeles, Salt Lake City and Phoenix. The economy image and rate structure of the Red Roof Inns should result in an increase in traffic to our property. VOE: With almost 350 hotels RRI nationwide (there about 12 in California), do you foresee a RRItrend developing in the SW? RRI: Absolutely! A budget and economy chain like the Red Roof Inn should be very successful in the face of a challenging economy with the budget conscious traveler seeking the best value for their money. VOE: What sets RRI apart from other economy-style hotels? RRI: The new ECOGEN style of rooms, with their clean and attractive design portrays a distinctively noticeable modern look to Red Roof Inn properties that sets them apart from other economy chains. VOE: What do you feel Red Roof Inn brings to Las Vegas in terms of customer comfort and value? 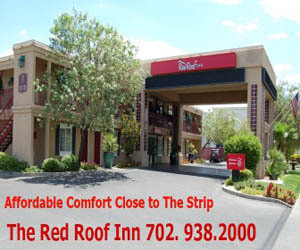 RRI: In contrast to the Las Vegas Strip and neighboring casino hotels, this Red Roof Inn provides the budget-minded guest a unique blend of clean and quiet, easily accessible rooms close to all the activities of the strip, UNLV, Thomas & Mack, and the convention centers. We are a particular favorite for concert goers at the Hard Rock Hotel. VOE: What are the three most important features about the Las Vegas Red Roof Inn? RRI: a.) Location and closeness to the airport, the strip, UNLV, Thomas and Mack, Convention Center, the Hard Rock Hotel. There are shopping malls and a variety of restaurants within walking distance. b.) Quiet retreat after a night of partying hard or after a hard day’s work. c.) Highly competitive room rates. VOE: In closing what would you like to say to welcome potential guests to the Red Roof Inn Las Vegas? RRI: We welcome you to the Red Roof Inn Las Vegas where we pride ourselves in our exceptional level of customer service at all times. Our entire staff from the porters to the manager is poised and eager to serve you and make every effort to meet or exceed your expectations at all times.